Teeth can move under continues controlled pressure inside the jaw bone and that’s the science behind orthodontic treatments in dentistry. This movement can be seen in a longer period of time when a patient losses a tooth leaving a room for adjacent and opposing teeth to move into the empty space. By using this knowledge dentists can move the teeth and rearrange them to correct the misaligned teeth which can have damaging result on the health of patient jaw joint (TMJ), gum and in general health of a patient. Capability of teeth to be moved can also improve the smile of the patient and has a positive impact on patient’s self-confidence in today world which social media and networking have direct influence on everyone’s personal life. One of the primary concerns people often have about dental braces is the aesthetic impact of the metalwork on their smile. Especially for adults, the prospect of wearing unattractive metal braces for long periods of time can be very discouraging. Invisalign® or Clear aligner offers an almost invisible aligning system that straightens teeth fast and contains no metal. Invisalign® offers adults and teens a flexible method for straightening teeth without imposing unattractive metal braces. The clear aligning trays reduce aesthetic concerns and put the patient in charge. One of the important advantage of Invisalign over the conventional braces is the oral hygiene concerns which can be more effective and easier whit Invisalign treatment.Wearers also can simply remove the trays when they want fully natural smiles, such as for school photographs or a special event. Like traditional braces, Invisalign® can be used to correct a number of issues including overcrowding, gaps between teeth, cross-bite, overbite and under-bite. The aligning trays are nearly invisible, and they produce results by gradually shifting teeth into desired positions. Patients visiting the dentist in Downtown Vancouver have impressions taken of their teeth to build custom trays. Every few weeks, new trays are created that will continue the gradual alteration of tooth position. Straightening teeth through the use of incrementally adjusted trays allows patients to influence the duration of treatment. Wearing the trays as much as possible speeds up results. People wearing their trays during a reduced schedule will need more time to create their desired smiles. This flexibility helps patients access the benefits of Invisalign, without interference with their lifestyles. 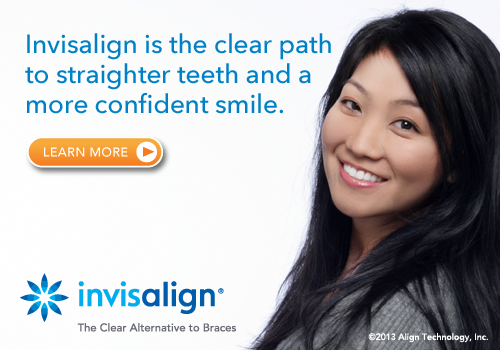 Most patients report total satisfaction with their Invisalign® experience and results. For people who need dentists in Vancouver or Coquitlam, Ace Dental Center has the resources to manage Invisalign® treatments and provide services like an emergency dentist in Vancouver, dental implants in Vancouver, and Vancouver oral surgery. Invisalign® is preferable to veneers in many cases because unlike veneers, Invisalign® actually straightens the teeth. Veneers are thin covers that the dentist permanently affixes to the teeth. Teeth must be etched beforehand, meaning that to remove dental veneers, an alternative covering must be constructed. In addition to being somewhat expensive, veneers can break and often last for less than 10 years. If you have questions about Invisalign®, please ask our dentist. What are the steps in Invisalign Treatment ? At the first visit we perform a complete exam of your teeth and soft tissue and evaluate your bite to make sure you are a good candidate to have Invisalign treatment. All the decays need to be restored before starting the treatment. Necessary Impressions, X-rays and photograph are taken to be evaluated by our Dr. Rahgozar how is a certified Invisalign provider. When all the information is gathered Dr. Rahgozar will set up a treatment plan for your orthodontic treatment and will be submitted to align tech to manufacture the aligners. Which depending on your unique situation can be 20-30 sets of aligners. Each aligner will be used for 10- 14 days throughout the treatment. Your treatment need to be monitored closely by Dr. Rahgozar every 4-5 weeks in each visit necessary required adjustment will be perform to reach the desired outcome.